A transversal is a line intersecting two or more lines T is the transversal. 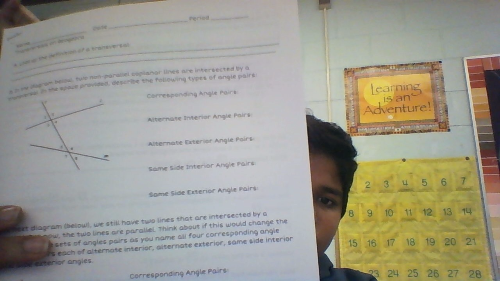 Corresponding Angle Pairs are angles in the same corner. Alternate Interior Angles Pairs are angles that are on the opposite of the transversal and inside the two lines. Alternate External Angle Pairs are on the opposite of the transversal and outside the two lines. Same side Interior Angles are angles that are on the same side of the transversal and on the interior of the two lines. Same side Exterior Angle Pairs are on the same side of the transversal and on the exterior of the two lines.